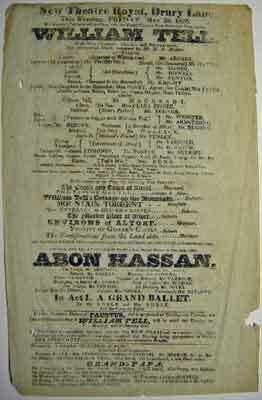 Some minor loss not effecting text 13 3/8 x 8 3/8"
A Rare THEATRE HANDBILL 1825 with the rôle of William Tell played by the eminent tragedian Macready, and Miss Clara Fisher (1811-1892) the most eminent child actress of the age, took on the rôle of Albert for this production at age fourteen; Mrs. Bunn wife of the theatre lessee, (Alfred Bunn) played Emma, Tell's wife. Act I by Mr. & Mrs. Noble, other upcoming plays are listed including Faustus and Grand-Papa. 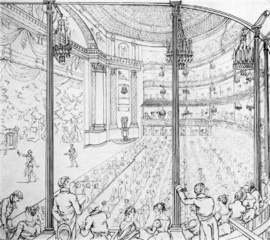 The really interesting item of note for collectors of early theatre is that the scenery for William Tell was painted by four of the greatest scenery painters of the Georgian era: David Roberts; his friend and great rival at the time, Clarkson Stanfield along with the aging Marinari; and a re-work of stage scenery of the then deceased Andrews by Adams. This is a rare find for collectors of David Roberts items. Such play bills are rare as they were considered ephemeral, and this one is significant as it lists five examples of scenery by twenty-two year old Roberts & Stanfield who were considered to be among the top scenery painters of their day, both went on to become international fine artists of considerable repute, but here we find them earning a living at five guineas a week, at the beginning of their careers. But more so what their training taught them as scene-painters greatly influenced the drama of their later works. Productions relying more on scenery and effects than on dialogue and acting remained commonplace in the new facility. The 1823 production of Cataract of the Ganges had a finale featuring a horseback escape up a flowing cataract "with fire raging all around." William Charles Macready, (born March 3, 1793, London, Eng.—died April 27, 1873, Cheltenham, Gloucestershire), English actor, manager, and diarist, a leading figure in the development of acting and production techniques of the 19th century. In 1810 he made his debut in his father’s company, as Romeo, at Birmingham and rapidly acquired fame in other roles in provincial theatres. 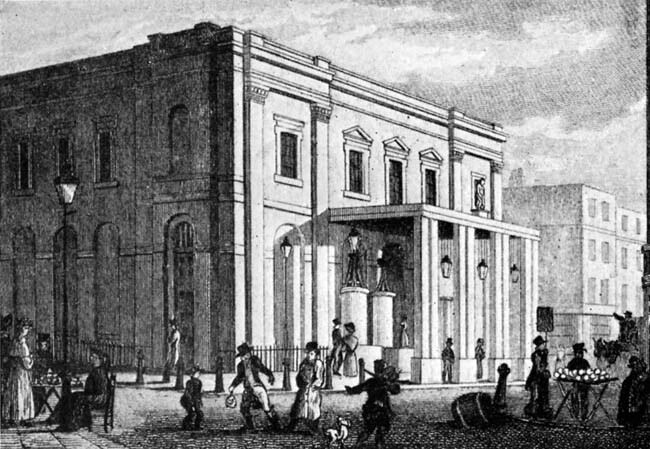 In 1816 he appeared at Covent Garden, London, and played a series of melodramatic villains. He performed with such earnestness and truth that he became firmly established, and by 1820 he was recognized as one of the finest contemporary English actors, second only to Edmund Kean. Macready achieved his greatest fame playing such Shakespearean roles as Hamlet, Iago, Lear, Othello, and Richard II.